Lake Front home with dock. Enjoy and relax! Nothing like waking up to a beautiful view of the lake.Summer is the best time on a lake, swim, float,kayak,fish or just enjoy the 5 man paddleboat..Sullivan County is a great area to visit and enjoy all the many attractions it has to offer. 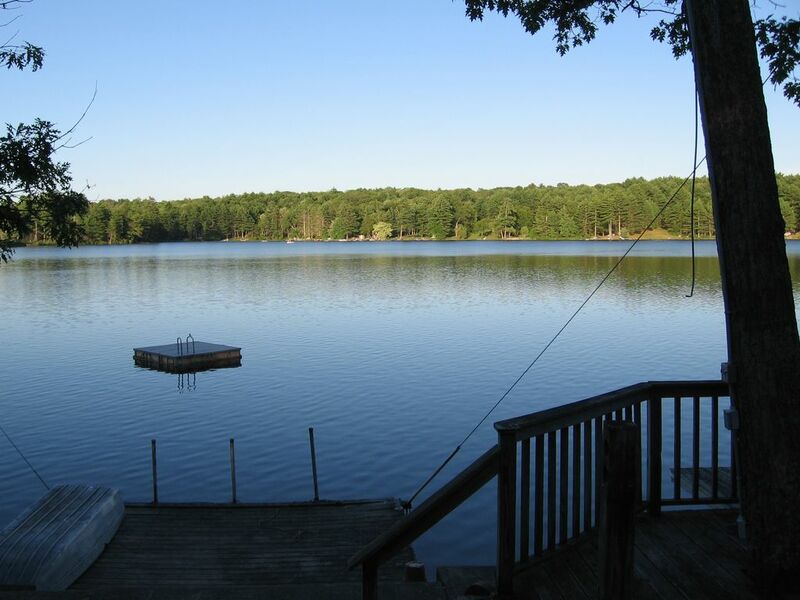 Relax on the Patio by the fire pit or enjoy a sunrise on the dock. Swim out to the raft and enjoy the sun. Great area to take a walk or run, great trails. 2 hrs 15 min from Manhattan. 20 mis to Metro North Train Station. Bethel Woods Art Center (home of original WoodStock) 15 miles away, great Concerts coming this year! Forestburg PlayHouse 4 miles away. If you do not hear back from me right away by e-mail...PLEASE Call my home or cell. Additional fees may apply when paying by credit card. Bethel Woods: Many summer concerts to see. My husband and I re did this property in 1996 so we could get married and raise a family here. We had our first child in 1997, second in 1999 and our 3rd in 2001. We loved living on the lake but wanted more yard for the kids to play. We did not want to give up the lake house so we rented it for a few years. After many tenants not caring for our home we decided to do weekend and weekly rental, so people could see and enjoy the lake the way it should be enjoyed. After 13 years of not staying in this house, my husband and I brought our 3 kids back and spent labor day weekend here with them and some of their friends. Boy did they have a blast! 80% of our time we were outside or on the lake. We swam, went kayaking, paddleboat around lake, road bike, played cards, cooked marshmallows, sat around the fire pit and reconnected with each other. There was no X box playing, no TV watching it was us all enjoying what family is all about. Why this property? Why not reconnect with each other! We may have a small town, but we have a lot around. There is something about the lake that make you feel calm and relaxed. Please, if you smoke, smoke outdoors. We also want to no that we are very strict on the No Pets, please understand.Paddle boat only in use during Late Spring,Summer and early Fall. We have a summer house nearby but needed extra space for a family gathering. Kelly couldn't have been more accommodating with our last minute booking of their house. The house was immaculate, spacious and well-equipped. Our grandchildren (and the adults!) loved the convenience of walking out the front door just a few steps to the lake. We enjoyed the boats and fishing from the dock (didn't catch anything but my grandson had fun). Took a long walk around the lake and on some wooded trails, and everyone worked on one of the puzzles that we found on the shelf. We'll definitely try to stay there again if we need the extra room. Glad you enjoyed the lake! Yes, please think of us again when you need more room. My college friends and I had a wonderful stay this past weekend at Kelly and Mitchell's home. It was very well appointed and all of the beds were comfortable. We spent the entire day hanging out on the dock even with the cloudy day. Cant wait to book again and hopefully have some sun to enjoy the lake. Would highly recommend. I am so glad you all had a great time. We love relaxing on the dock as well. Please come back and visit the lake again! Amazing owners to deal with. They answered any questions we had with minutes. The house fit our family perfectly. The lake was so much fun with so many different types of boats to use. They supplied us with extra towels and not having to bring linen was so great. The front yard was completely gated in which made it so much easier with a little one. All the bedrooms where spacious especially the master bedroom. They supplied us with board games to play with besides the 3 tvs vcr and dvd player with movies to watch. Great place to go ! A home away from Home! Refreshing and Recharging mini vacation! My family of three just stayed at Kelly and Mitch's place this past 3 nights. We had a wonderful time to say the least. Owners Kelly and Mitch are very accommodating and friendly. All questions were answered prior to do and during the stay. No issues with house at all as it was perfect. We spent most of our time by the lake in front of house. We swam, boated, and fished ( well at least I fished). The lake is beautiful and clean and the neighborhood is filled with nice people who we met mostly while walking their dogs. As an Air Force Veteran, I was happy to see American flags proudly displayed in the community. For the fisherman that come to the area I found a great place to buy bait on Caskey Lane in Glen Spey right of Route 31. I caught a 5 lb LM Bass right in front of the neighbor's dock. Also caught crappies, and a catfish. Thanks again for sharing your home with us and I will recommend and refer you others who are looking for this type of vacation. We spent four days in late June at this home. We found it to be just what Kelly says it is on this site. Everything was in good condition and we had no problems. Three of the four days were beautiful weather and we got to enjoy the lake and the paddle boat. The water was cool, particularly for us as, we came from Florida, but we enjoyed swimming in it anyway. Lake traffic was very quiet and this added to the enjoyment of it. There are some very good restaurants nearby and we particularly enjoyed Bakers Tap Room. If you go, be sure to have the onion soup ! We went twice just to enjoy this fantastic soup. One of the best ones we have ever had. Overall, a very pleasant four days spent at this home. Friends and I had the absolute best weekend at Kelly or Mitchell 's beautiful lake-front home. Their home is very inviting and looks exactly like the photos and as described. Both Kelly and Mitchell were incredibly helpful in answering all our questions prior to the trip. The lake was absolutely amazing and we very much enjoyed all the amenities they kindly made available for us to use. We had plans to go river rafting but we were enjoying ourselves so much that we decided to stay at the house and enjoy the lake all weekend instead! Thanks so much Kelly and Mitchell! Holidays extra fee, ask for holiday rates Prefer E CHECKS, Free of charge or mail me a check. Credit Cards, subjected to additional fees Starting June 28th I only rent by the week, Saturday to Saturday. If you would like only a few days, it would have to be b4 June 28th or after Labor day. You can send me an e-mail at any time with any questions. I am pretty good at responding within the hour.